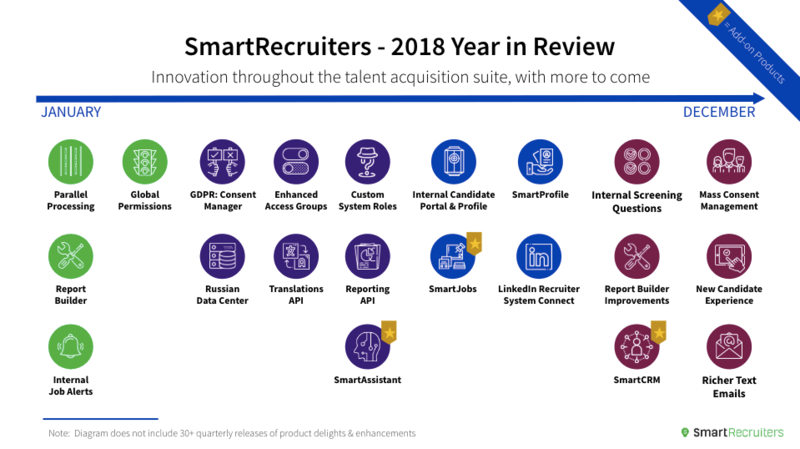 Talent Acquisition teams can experience the latest configurability, optimization, and sourcing upgrades in SmartRecruiters’ January 2019 product release, which delivers the highest-voted user requests to date. SAN FRANCISCO – January 31, 2019, 8:00 AM PST: SmartRecruiters, the Hiring Success Company, introduces today a number of highly anticipated, user-requested product enhancements as part of the January 2019 product release, dubbed the “Winter of Love”. Building on innovations over the past year, the latest updates enhance workflow optimization, enterprise configurability, and sourcing effectiveness for hiring teams already using the SmartRecruiters enterprise recruiting platform. “While we’ve expanded the talent acquisition suite by offering the industry’s first and only native AI recruiting and candidate relationship management solutions, SmartRecruiters’ latest product release demonstrates our ongoing commitment to core functionality while making innovation leaps,” says Jerome Ternynck, Founder & CEO of SmartRecruiters. The latest release comes on the heels of a busy 2018 for SmartRecruiters, which saw the launch of three brand new add-on products: SmartAssistant, a native artificial intelligence-powered recruiting service; SmartJobs, an intelligent job advertising platform; and SmartCRM, a native candidate relationship management solution that enables proactive hiring. “If I think about one sentence to describe last year for the SmartRecruiters product team, it was all about innovation and extending our product offering to support new ways of giving [our customers] assistance in achieving hiring success,” says Natalia Baryshnikova, Head of Product Management at SmartRecruiters. This year, SmartRecruiters continues its commitment to ongoing innovation, beginning with workflow optimization features to the core platform. Given the amount of time that hiring teams must spend on TA platforms in order to make great hires, SmartRecruiters sought to boost recruiter efficiency and reduce the amount of time spent on non value-added tasks. The latest update includes major candidate processing features like mass status change and screening question filters, designed to improve the lives of users who need to work at scale. For global enterprises, the demand for deeply configurable security and access permissions is top priority. To better align with the unique needs of large organizations, the latest release introduces custom hiring team roles, user-defined access permissions for hiring team members, field recruiting app permissions, and configurable candidate consent request templates. As more companies invest in proactive recruiting strategies, the more that sourcing tools like CRM are becoming must-haves for hiring teams. SmartRecruiters incorporated early customer feedback on SmartCRM into the latest release by extending lead capture forms for greater customization, as well as improving the candidate experience by allowing candidates to 1-click apply for open roles with their SmartProfile. As with previous SmartRecruiters product releases, these major updates come accompanied by a number of additional platform enhancements that aim to provide customers with a platform that stays at the forefront of performing talent acquisition teams. Thanks to deeper customization, more optimized workflows, and improved sourcing functionality, hiring teams on the SmartRecruiters platform are better positioned to make great hires that drive business success.